10 Tips For Cooking With Fish! It’s Halibut Season and Market Street is serving it up! If you’re serving a whole fish, figure about 1 pound per person, allowing for discarding the head and bones. For fish fillets and steaks, figure about half a pound per person. And, by fishy, that means unpleasant. Fish should smell like the sea. If you are buying whole fish, the eyes should be clear and the skin should not be slimy. Some say fresh fish is always better but you need to know that unless you catch it yourself (or your neighbor is kind enough to share his catch), the fish was likely partially frozen on a commercial fishing boat. Frozen is not necessarily worse. Fish is done when it is opaque and flakes easily with the touch of a knife or fork. Learn some basics about how different fish taste, and you can deal with anything you find at the grocery store or market. For instance, when a recipe calls for a firm, mild fish you can use grouper, striped bass, snapper, redfish, halibut, cod or sea bass. Tilapia will also work. White fish are also leaner than salmon and tuna. When cooking fish with direct heat, grill or skillet, make sure your pan is very hot. The high heat sears the fish and keeps moisture in. The high heat also prevents oil or butter from being absorbed into the flesh. If needed, you can always lower the heat after searing. 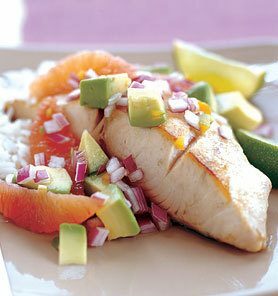 Take advantage of the versatility of fish, much as you do with chicken. It can be breaded and sauteed; roasted with aromatic herbs; grilled by itself or in packets with lemon and julienned vegetables; poached; stuffed and baked; and always fried. When you thaw previously frozen fish, do not refreeze. You should plan to cook it within a couple of days of purchase. Always start cooking with presentation side down, meaning the side that hits the heat first is the side that diners will see on their plates. Doing this will result in an appetizing golden crust when served.